Here’s a promising metric for Amazon, in terms of its ability to maintain its current lead in the voice computing market: 42 percent of smart speaker owners have two or more devices, according to Edison Research. This figure is seemingly growing, too. Last year, there were about 1.18 Amazon Echo devices per Alexa household, but this new finding pushes the number to around 1.5 to 1.6 smart speaker devices per household. Not exactly apples to apples, but Echo still dominates. Amazon today has a solid lead in voice computing, despite new entrants on the market like Google Home and soon, Apple’s HomePod. A recent survey estimates that Amazon has sold more than 10 million Alexa-powered Echo devices since late 2014. Morgan Stanley believes that figure could be more than 11 million. Amazon is also forecasted to control 70 percent of the voice-controlled speaker market this year. The number of Internet connected devices that people have is going up, especially in North America. There will be four networked devices and connections per person globally by 2021, according to the latest annual visual networking index forecast by Cisco. However, in North America, there will be 13 networked devices and connections per person, up from eight last year. The means that beyond smartphones and connected TVs, North American consumers will be adopting many more connected gadgets. The end result is that all those connected devices will be creating new and massive data streams, much of which will be used to mine for new consumer insights. During the same timeframe as the mass connected device adoption, broadband speeds will nearly double. Some of those speeds are already being delivered in the U.S. today by Verizon. The speed and additional connections don’t necessarily mean that consumers will do things faster. However, it does mean that consumer access to information and content, especially streaming video, will be accessible more quickly via more devices. Over time, consumers are likely to lean more on their smart devices to automate tasks for them. Today, this can be as simple as asking Amazon’s Alexa to order a coffee from Starbucks. Tomorrow, this could involve the connected technology, powered by artificial intelligence, to know, in advance, when to order that coffee. And from where. And have it delivered via any number of means now in trial. 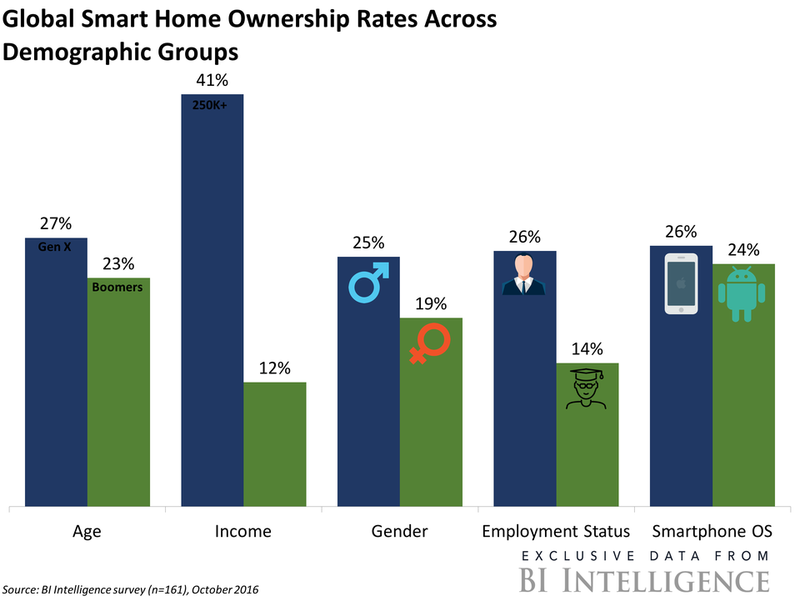 Even with these challenges, many of the biggest consumer technology companies are now moving into the smart home market. For example, Apple, which recently released its self-installed smart home ecosystem, called the Apple Home, traditionally doesn’t move into a market until it’s very mature and only when it can release a perfected product. Further, Google this fall launched the Google Home and its companion ecosystem, hoping to jump into the voice-activated smart home speaker market, which Amazon currently dominates with its Echo product line. In a new report, BI Intelligence examines the demographics of the average smart home device owner and discuss why current smart home device owners are appealing to tech companies. The report also examines the plans of various tech giants in the smart home market and discuss their monetization strategies, and makes suggestions for how these companies can position themselves to make their products and devices more appealing to the mass market.